Lil' T assumes her post, as she does most mornings, on my chest, purring loudly in hopes that I will wake-up and deliver to her bowl fishy smelling deliciousness. And I do. Sunny and seventy something degrees, I needed no prodding to gather my things together and head to the beach. There is a little café along the way that I visit about once a month, I stopped and took a seat at the counter. I'm still feeling the place out, trying to decide if I like it or not. The service is just okay, the pancakes and the potatoes are good, but one of the owners/waiter has no idea that being nice to people is a prerequisite for a service job that involves tips. Today I wore a t-shirt that I picked up over the holidays while visiting Zanzibar, a beautiful island off the east coast of Africa known for it's many spices. So, I'm sitting at the counter reading the paper and eating breakfast when the other owner, the nice one, tells me she likes my shirt. 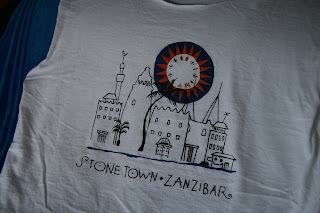 She smiles, laughs a little and then says out loud, "stonetown". She says it again with the emphasis on stone, followed by a little laugh much like the laugh that is so stereotypical of a teenaged stoner. Still smiling and elbowing her co-worker to look at the shirt she asks where she can get one. If I told you, I'd have to... ..you know.